The USS Lassen is expected to imminently begin FONOPs near Subi and Mischief Reefs. After weeks of signaling that it would initiate freedom of navigation operations (FONOPs), the U.S. Navy is set to deploy the USS Lassen, an Arleigh Burke-class destroyer, within 12 nautical miles of China’s man-made islands in the South China Sea. Reuters, citing a U.S. defense official, confirmed that operations were set to begin “within 24 hours” of its report, suggesting that the Lassen will sail near the Chinese artificial islands sometime on Tuesday, October 27, local time. Per the Reuters report, the Lassen will be accompanied by a P-8A Poseidon maritime surveillance aircraft. A P-3 Orion surveillance aircraft may support the Lassen as well. The report confirms that the Lassen will sail only within 12 nautical miles of Subi and Mischief reefs in the Spratly archipelago in the South China Sea. Subi and Mischief represent two of seven features where China has carried out substantial land reclamation and construction work. The two features are distinct from the other five features where China has carried out similar work, including Cuarteron, Gaven, Fiery Cross, Johnson South, and Hughes reefs, because the original reefs, prior to China’s island-building, were fully underwater at low tide. Under the United Nations Convention on the Law of the Sea (UNCLOS), low-tide elevations receive no special consideration that would grant them rights to a 12 nautical mile territorial sea. Similarly, artificial islands are not entitled to a 12 nautical mile territorial sea, but are instead treated like oil rigs and similar installations, entitling them to a 500 meter safety zone. Thus, the Lassen will sail within 12 nautical miles of Subi and Mischief but will likely avoid entering the 500 meter safety zone. 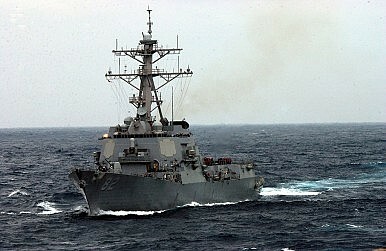 Last week, the USS Lassen arrived in Kota Kinabalu, Malaysia for a port visit after a routine South China Sea patrol. The crew of the Lassen appears to be experienced in interactions with Chinese People’s Liberation Army-Navy vessels under the U.S.-China Code for Unplanned Encounters at Sea (CUES). According to a release by the Lassen‘s public affairs officer, on its last patrol in the South China Sea, the destroyer encountered two PLAN Jiangkai-II-class frigates, the Yueyang and Yantai, and a Jianghu-class frigate. CUES operations between U.S. and Chinese ships have been taking place for some time since their endorsement by naval leaders at the April 2014 Western Pacific Naval Symposium. If the Lassen does sail within 12 nautical miles of Subi and Mischief Reefs tomorrow, it will represent an assertion by the United States that the waters surrounding these islands remain part of the high seas. As various authors have noted in The Diplomat and elsewhere, FONOPs do not directly challenge Chinese sovereignty claims over the maritime features in question. Instead, the United States would be asserting that it does not recognize the legitimacy of maritime claims emanating from artificially ameliorated low-tide elevations. Given the careful telegraphing of FONOPs in the Spratlys over a period of weeks, China has had plenty of time to decide how it will react when the Lassen sails by these reefs. It’s hardly been a month since Chinese President Xi Jinping left Washington D.C. after his inaugural state visit to the United States, but the Obama administration has decided that it’s had enough of “testing the waters” in the South China Sea. The USS Lassen sailed within 12 nautical miles of a Chinese man-made island on October 27, 2015.